“Victory," said Wellington, "be­longs to the commander who makes the best guess as to what is hap­pening on the other side of the hill." The aeroplane changes the guess to a cer­tainty. It tells a general what his enemy is doing not only behind the first hill but behind any number of hills. It gives information that would bring almost certain victory - if the other general were without similar information. The air scout is an absolute essential in modern war­fare. The complete superiority in the air branch of the service would be worth many thousands of men to a modern army, for it would enable the commander to know the enemy's move­ments and therefore to make the most efficient use of his own men—and waste none where they were not needed. The results of two months of war show that the aircraft, principally the aeroplanes, have given results beyond even the most enthusiastic expectation. 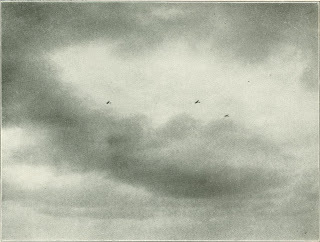 Though the reports of spectacular happenings, such as dropping of bombs, oc­casional encounters of aeroplanes in the air, and aircraft ramming each other show striking points of value, the most valuable accomplish­ment has been, as the eyes of the armies and navies, watching the movements of the enemy, thereby removing the element of surprise. The war was only a few days old when the Belgian air scouts scored the first success, the results of which have influenced the entire cam­paign. There is evidence that Germany in her underestimation of the tenacity of Belgium did not make good use of her air scouts. It relied entirely on the overwhelming strength of her formidable army and did not consider it neces­sary, to employ air scouts to find the vulnerable spots and offset the advantage gained by Bel­gium through its very judicial employment of the able Belgian air scouts. The Germans started in with a crushing preponderance of men, but played the game in accordance with plans made litany years ago, with little con­sideration to the immediate moves of the enemy, while the Belgians with few men, but employing a score of efficient air scouts, moved as circum­stances dictated. The result was a compara­tively large loss of men and an inestimable loss of time on the part of the Germans. Subsequently, however, the German air scouts were employed very extensively. Each day during the war has brought reports of ex­ploits of German aviators. They have been reported as far as one hundred miles from their nearest base, have dropped bombs and mani­festos on Paris and several other cities - rather venturesome undertakings considering that there were scores of French aeroplanes about that were reputed to have a speed of 120 miles an hour, twice the speed of the German machines. 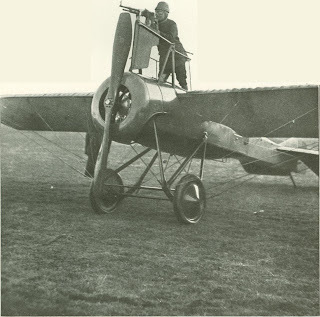 French aviators at the front have paid compli­ments to those hardy German aviators who circle unceasingly over the troops throughout engagements, continually watching the move­ments of the Allies. "One of the features of the campaign on our side has been the success obtained by the Royal Flying Corps. In regard to the collection of information it is impossible either to award too much praise to our aviators for the way they have carried out their duties or to overestimate the value of the intelligence collected, more especially during the recent advance. "To give a rough idea of the amount of work carried out it is sufficient to mention that during a period of twenty days up to September loth a daily average of more than nine reconnaissance flights of more than one hundred miles each has been maintained. "The constant object of our aviators has been to effect an accurate location of the enemy's forces and, incidentally, since the operations cover so large an area, of our own units. "The tactics that have been adopted for deal­ing with hostile air craft are to attack them instantly with one or more British machines. This has been so far successful that in five cases Ger­man pilots or observers have been shot while in the air and their mach­ines brought to ground. As a con­sequence the British flying corps has .succeeded in establishing an in­dividual ascendency which is as serviceable to us as it is damaging to the enemy. "How far it is due to this cause it is not pos­sible at present to ascertain definitely, but the fact remains that the enemy have become much less enterprising in their flights. Something in the direction of the mastery of the air already has been gained in pursuance of the principle that the main object of military aviators is the collection of information. "Bomb dropping has not been indulged in to any great extent. On one occasion a petrol bomb was successfully exploded in a German bivouac at night, while from a diary found on a dead German cavalry soldier it has been dis­covered that a high explosive bomb, thrown at a cavalry column from one of our aeroplanes, struck an ammunition wagon, resulting in an explosion which killed fifteen of the enemy." Air scouts may be thankful that it so happens that the altitude required to keep out of reach of rifle fire is not too high to allow clear ob­servation of things below. The British War Office's instruction to air scouts is not to fly lower than 3,000 feet when exposed to rifle fire, and to add another thousand feet when artil­lery is underneath. The French agree on these figures and pilots are officially instructed to regard them. Under misty conditions it is left to the pilot to drop lower if objects cannot be distinctly seen. At the altitude of 3,000 feet a trained observer can distinguish moving bodies and characteristics of arms, which is all important, since the presence of artillery at a certain point means quite a different state of affairs than the presence of cavalry or infantry, and requires different action. Only a part of the observers acting in this present war had had experience, and the results would have been mournful for air scouts had it not been that there was likewise a lack of experience in shooting against aircraft. Reports in the first month told that the air scouts of both sides, probably in efforts to make up for their lack of experience, flew very low, mostly at from 1,50o to 2,000 feet. The fact that only a score out of 5,000, were brought down shows that the shooters were not in a position to take advantage of their inex­perience. (I) The accurate observation of bodies of troops largely depends on two circumstances: (a) The background, that is, the color of the ground on which the troops may be at the mo­ment; and (b) Movement, i.e., troops on the move are far more easily seen than when they remain absolutely still. (2) A column of troops moving along a white or light-colored road can be easily seen from almost any height, whilst an extended line of infantry scattered on the grass amongst small bushes will seldom be detected if they remain still. Troops should on no account look up at aircraft, for nothing is more conspicuous than men's faces. (3) When troops are marching along a broad road it is advisable that strict march discipline be maintained, the troops being kept well to one side of the road, so that the remaining side, if kept absolutely clear, will look like the whole of the road, and will probably not attract the observers' attention. (4) Troops in column of route on a narrow road may escape observation if they at once take cover on either side of the road, and re­main absolutely still, close under the hedges. (5) Woods, belts of trees, high hedgerows, and villages all offer complete shelter from ob­servation if taken advantage of when the air­craft is still at a distance. (6) When moving over country in extended order or in small columns, troops should take cover under the nearest trees, hedgerows, or patches of gorse and bushes, lying still, close under the edge of such vegetation, until the aeroplane has passed on. (7) Formed bodies of infantry must be got sunder trees or into woods if they are to escape observation, for in the open they are certain to be seen. (8) Artillery will probably be unable to conceal either their guns or their horses, except in very favorable country where trees are numerous and the view much restricted. Guns in the open will no doubt be easily seen, and the only hope of concealment is to occupy a position close up to a hedgerow and fire through it. (9) When troops are in camp, or in bivouac, every endeavor should be made to alter the usual formations with a view to deceiving the observer, and causing him to mistake one unit for another, e. g., a battery for a Field Com­pany, R. E. Guns can be covered with tarpaulin or hay. Where feasible, cooking should be done near villages, so that the smoke does not attract attention. (l0) The question will often arise as to how long the presence of a hostile aeroplane is to be permitted to interfere with or paralyze the manoeuvre which may be in progress. Time may be a more important element than dis­covery, and brigade commanders must judge whether it is more advisable to delay the move­ment by taking cover and remaining hidden, or to continue the manoeuvre. As General Bonneau, of the French Army, expressed it after using aeroplanes in the manoeuvres. "With the aeroplane everything is seen by the eye; nothing is left to guess." With the aeroplanes there are no military "curtains," nor any covers that can hide from the chief of the army the depth, width, and composition of opposing forces, the position of their reser­vations, their evolutions in front and rear. The general who knows how to use aviators will always be posted from instant to instant of the movements of the enemy. 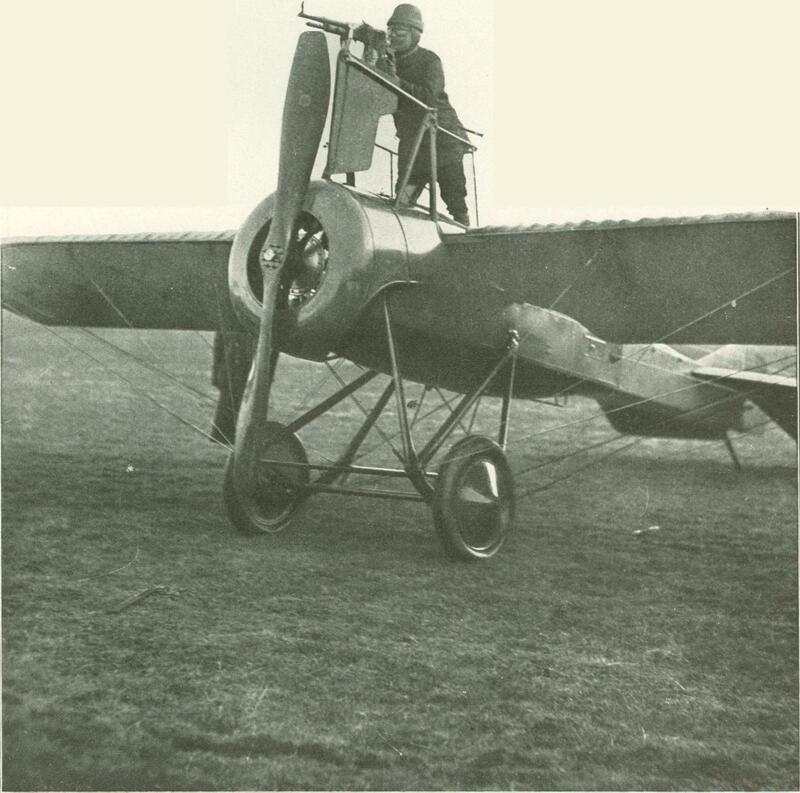 But although the greatest influence the aero­plane has in war comes from its almost instan­taneous scouting abilities, enabling generals to improve their strategy, it also is extremely useful in aiding the tactics employed on the battlefield. It is of particular service to modern artillery which usually fires from a concealed position at an enemy which the gunners cannot see. It is often difficult even for the officers of a battery to gain a position from which to observe accur­ately the results of their battery's fire. But nothing obstructs the observation of an aero­planr hovering over the battle. General Brun, the head of the French Army in 1910, was responsible for the first experiments with aeroplanes to direct this fire. "From the time guns were invented no device or technical invention has been developed which increases the efficiency of artillery as much as the aeroplane does." "Last night an air scout located a train filled with retreating German soldiers, and the pilot dropped a torch to indicate the range. Our ar­tillery blew the train to atoms in a few minutes." Using aeroplanes in connection with artillery, to find the range and "spot" shots, has made the later period of the war, that which followed the check of the Germans by the Belgians, remarkable for its swiftness in taking fortified places. The aeroplanes have supplied infallible eyes to the big siege guns, and have more than doubled the efficiency of gun-firing. To realize the extent of the economy of this we need but consider that an aeroplane costs only as much as a single shot of a fourteen inch gun! All sides, with the possible exception of Austria and Russia, are using aeroplanes with their big guns - insufficiency limits a more extensive employment. Naval aeronautics has not yet figured in the news from the front. But it must be remembered that to the date of this writing there have been no serious engagements. It is quite pos­sible, as a matter of fact, that the air scouts are responsible for the inactivity. England at the start of the war had powerful and well organized naval aviation corps. Six naval aviation centres have been established in the last year at Grain Island, Kent, England; Calshot, Hanks, England; Great Yarmouth, England; Felixtowe, England; Fort George, Inverness, N. B., and Dundee, Scotland. seaplanes, of which there were about two hundred available, are very efficient craft, mostly high-powered, armored, equipped with wireless apparatus and quick-firing guns. None of the other countries has developed this arm as ex­tensively and efficiently as Great Britain. 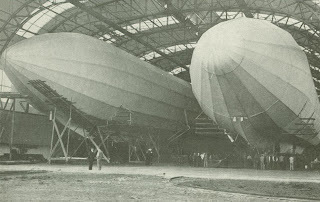 Most of the other countries have confined their development to using water air craft for coast defense; and Germany relied almost entirely on the alleged superiority of her naval dirigibles, the Zeppelins L-1, and L-2, which met with mishaps; and, subsequently, on the L-3 and the Schutte Lanz. Only recently it was thought, advisable to give inducement for the develop­ment of seaplanes and flying boats. The British naval air scouts with their swift and armed seaplanes also seem to have shown capability to fight the Zeppelins, and the German authorities very wisely have not risked them. All the dreadnaughts are, besides, protected from dirig­ble attack by guns, and some by armor. The flagship of the first fleet, the Iron Duke, is protected by both armor and guns against overhead attack. Since the beginning of the war there has been expectation of night attacks by Zeppelins on Paris and London and the Allies' sea-fleets, the notion being that something of a general destruction would result. If such thing were possible - if half a dozen airships costing altogether less than two million dollars, manned by one hundred and fifty men, costing comparatively nothing to operate, could bring such results, then surely it would be rank waste to have dreadnaughts which cost from twelve to fifteen million dollars sands of men and thousands of dollars a day to operate. It would be cheaper by far to have transports with aerial escorts. However, the dirigible has not accomplished what was expected of it. Its potentiality has been restricted by the aeroplane. So long as battleships and cities had nothing but guns or slow aeroplanes to defend themselves with, the dirigible loomed as a terrible menace; but with the present day armored and armed seaplanes and aeroplanes capable of a speed of ninety miles an hour and of staying in the air for hours and of flying at night as well as by day, the dirig­ible's safety is endangered unless it is accom­panied by aeroplanes to defend it. The two hours required to take it out of the hangar and start it form a handicap in scouting work, and the aeroplane is preferred. A year ago the declaration of war would pro­bably have been followed by an attack on London and the English coast by the dirigibles stationed at Cologne, Heligoland, Kiel, Cux­haven, Wilhelmshaven, Dusseldorf, and Frank­fort. But last year the British authorities took notice of the fact that Germany had faced Great Britain's new strategic frontier with the best of her aerial fleet and organized the power­ful army and navy aircraft corps. London is only 300 miles from Cologne and less than one hundred miles more from Dusseldorf, Wil­helmshaven, and Cuxhaven, and though Zeppelins could cover that distance easily it is not likely that they will. Nor is there much likelihood of an attack on Paris by many Zeppelins. The dirigibles of Metz, Strasburg, and Mann­heim could reach Paris, which is between 200 to 250 miles away, in from four to six hours, which is not a long cruise for a Zeppelin. Starting from their hangars at seven o'clock in the even­ing they would arrive over Paris after midnight; but could hardly be back to the German lines, after delivering the attack, before day­light. On the way they would be exposed to aeroplane attacks and the odds would be against them. At night a Zeppelin makes a large outline against the sky, whereas an aeroplane cannot be seen approaching. An aeroplane can fly all around a dirigible at dusk, and the defenders of the dirigible would have difficulty to follow its movements. On the other hand the Zep­pelins, being close to five hundred feet in length and more than forty-five feet in breadth, make rather vulnerable targets for present-day guns. Taking all in consideration it seems that though raids might be made on large cities and a few non-combatants may be killed, the gain from such raids would hardly be worth the risk. 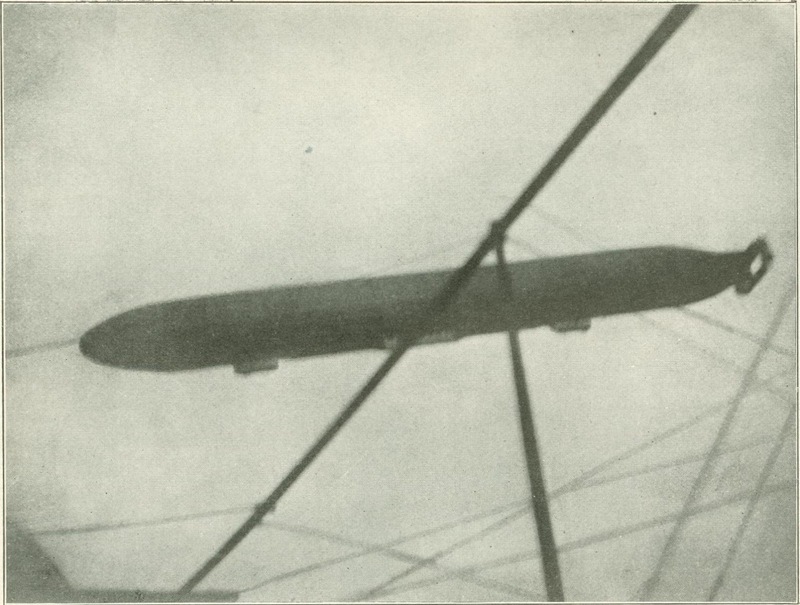 Until fleets of from ten to twenty dirigibles can be sent out to make raids or their speed is increased to seventy-five miles an hour - which, however, may come soon, even before the war is over - the dirigible's activity will be con­fined. Its present position compared with the aeroplane is very much the position of a large and slow transport equipped with guns against a fast small cruiser. A box 30 feet long, 15 high, and 18 feet wide was suspended from a balloon at a height of 1,000 metres (3,280 feet). The wind was strong and moved the box, so the difficulty of hitting it was little less than hitting an aeroplane. The dirigible circled around the balloon, and fired at 4,000 feet distance, first 50 cartridges with a machine gun, then with a cannon. The balloon was then pulled down and they found that almost all the bullets had struck. The balloon was sent back to an altitude of 1,200 feet, the dirigible went up to a height of 2,200 feet and fired 15 cannon shots from a distance of 6,000 feet. Two thirds of the shots were effective, three striking the black spots which represented the pilot and motor. The manoeuvre was repeated at a distance of 7,000 feet with the same results. Outside of the exploits of the few Zeppelins which dropped bombs on Antwerp and several other cities, terrorizing inhabitants and killing a score of harmless people, little has been heard of dirigibles. But they have been active and have many exploits, long distance reconnais­sances which could not yet be performed by aero­planes, to their credit. The German Zeppelins, the Schutte Lanz and the Parsevals, the French Fleurus, Adjudant Reau, and the Spiess, and the British Astra have made long reconnais­sances, some extending through an entire night, during which they maintained constant com­munication with headquarters by wireless. As winter approaches and nights are longer and the movements of troops slower the dirigibles will be most active, as active as the aeroplanes allow them to be. The following estimates made from reliable official but unpublished reports and knowledge of conditions and aeronautical plans of the nations give the aerial strength of the belligerent nations at the beginning of the war. It must be added that for two years Germany and Rus­sia have kept their progress in aeronautics secret; last year England and France limited the nature of developments which could be made public. Only the few people closely connected with the aeronautical circles of different coun­tries know of the developments than have taken place. The only official figures outsiders can get are the official reports published at the end of the year 1912. Hence to the outside world France has approximately 500 aeroplanes, and England barely more than 100. These figures are incorrect. They represent only a fraction of the actual strength, as the writer has ascertained. For example, in the debates over the organization of the aeronautical branch of the French army at the Chamber of Deputies it was shown that the French army bought 300 aeroplanes in 1912 and 336 in 1913, and 208 were bought with the money collected by public subscription. This gives 844 machines to the French army without counting the large ac­quisitions of 1914. "There are fifteen dirigible airships built, building, or ordered at the present time for the naval wing." France: aeroplanes, 1,200 military, 500 added during the period of mobilization by acquisition of private machines and output of factories: Dirigibles, 12 of close to 400 feet in length; 14 of less than 300 feet in length; 5 privately owned, or 31 altogether. Germany: aeroplanes, 600 military, 400 added during the period of mobilization by acquisition and output of factories. Dirigibles, 12 Zep­pelins 4 of from 350 to 490, feet in length; 23 dirigibles of other types, including those pri­vately owned. Russia; aeroplanes, 800 military, 150 added during the period of mobilization. Dirigibles, 16 of different types, but mostly under 250 feet in length. England: 200 navy seaplanes; 300 army aero­planes; 300 added during the period of mobilization. Dirigibles, 15, mostly new, up-to-date machines acquired in the last twelve months. Austria: aeroplanes, 350, of which all but l00 were acquired at the beginning of hostilities. Dirigibles, 8, mostly less than 300 feet in length. 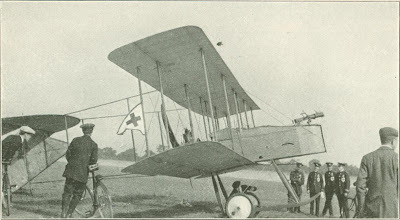 Belgium: aeroplanes, 40, and 40 acquired at the beginning of hostilities. Dirigibles, 2, one medium size, and one small. Servia: aeroplanes, 40, dirigibles, none. These forces were divided in each country in units composed of between one and six squadrons of eight aeroplanes each and one or two dirigibles and were stationed at aerodromes near military centres. Originally published in The World’s Work Magazine in November of 1914.